The GMG Item Qube 2 gets you exclusive titles, a cool outfit and some sweet accessories. Alongside plenty of other items, there is also the highly-prized gold VIP Membership! +120 max. energy points per day; +20% dzenai; +20% item drop chance; +5 displayable items on the Market; No Market fees; +2 days Market listing period; +20% chance of Grutins appearing in dungeons (including for group members). Are you a title collector? This one is an exclusive, it is only available in this pack! But be warned: other players may want to start poking you with questions about where you got this title from. Something’s missing after ‘Green Man’? Well spotted! As titles in SoulWorker comprise two separate parts, this exclusive secondary title completes the set. The fine material that this exclusive outfit is made out of, as well as the characteristic green colouring embody the affiliation to the Trader Alliance. With this gear too, be careful not to be poked full of holes from questions! Have the Hipster Glasses from the Green Man Box already raised your coolness rating? Well these Star Glasses are the celebrity amongst glasses and make you 40% cooler at the very least! In-game sunshine is way hotter than the real-world sun! This Straw Hat protects you from sunburn, or you can just use it as a cute accessory. Arrr! 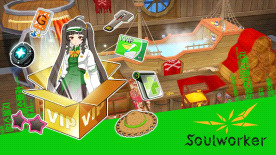 This furnishing set that holds 17 items will turn your SoulWorker home into a Pirate’s nest! Pockets full? This ticket will extend your inventory slots by 2x6 slots. Vitamin G, the vitamin of gaming, gives you an important resource in SoulWorker: 50 energy points (EP)!